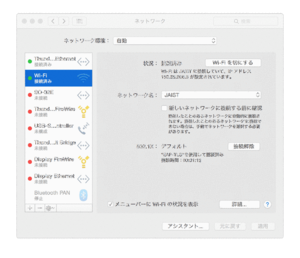 This page illustrate how to connect JAIST Wi-Fi via digital certificate using Mac OS X. #To use the secure network, please download and install your digital certificate as follows in advance. You need your digital certificate installed on "Keychain access". If you have not installed your digital certificate, you should import it first by following step. If you downloaded your digital certificate via Firefox, please export your digital certificate and double click the exported file. Turn on Wi-Fi, and select SSID "JAIST". The dialog "The Wi-Fi network "JAIST" require WPA2 enterprise credentials." will pop-up. Put and select following values. Ex. If you are student, use "sXXXXXXX@jaist.ac.jp" style instead of changed E-mail address. In case the above setting cannot perform, (for example, the mode selection does not work.) please follows the network connection manual. 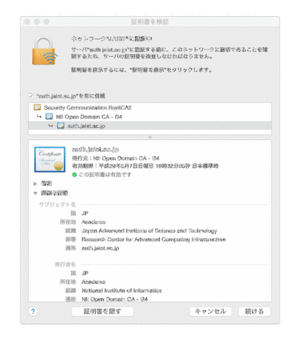 The dialog "Authenticating to network "JAIST"" will pop-up. You should check the following things. 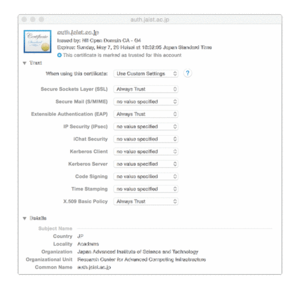 The server name on the sentence "Before authenticating to server -" should be "auth.jaist.ac.jp". The digital certificate should be valid. You can find blue facing certificate image if it is valid. Click "continue" after check these items. Finally, your Mac will connect Wi-Fi. Enjoy your wireless life. MacOS X has following known issue. When your PC move to another location, long-time (over several ten seconds) connectivity interruption may happen due to re-authentication process. You can prevent this issue by applying following workaround. 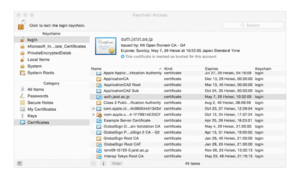 looking for auth.jaist.ac.jp on "Keychain access". Set the trust setting as "Always Trust" for Secure Socket Layer (SSL). 1. Select System preferences → Network → Details (bottom right). 2. Select "+" on the the screen and open the additional window of network profile. User Name: [JAIST Account] @ jaist.ac.jp ※ In case of a student, please follows this email address format "sXXXXXX@jaist.ac.jp".